Weidenbaum gracefully sustains that double focus through his close listenings to each of the 25 tracks and his evocative contextualization of the album’s origins, recounting, for example, its emergence amid “the populist flowering of British occultism, a rave-era echo of the Summer of Love.” He also deftly weaves into his discussion points about the cross-connections between ambient music and classical composers and ensembles like Alarm Will Sound. When the composer Caleb Burhans (a member of Alarm Will Sound) was assigned the project of scoring the “Blue Calx” track for his group with only acoustic instruments, he played on references to the beginning of Mahler’s First Symphony; the music of John Tavener and Ingram Marshall provided other classical precedents as well. 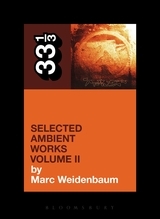 One of the most compelling sections of Weidenbaum’s book is on the so-called “beatless” nature of “Selected Ambient Works Volume II.” To put it country simple, when people first heard the record back in 1994, they had a hard time hearing beats. This, of course, was anathema to any electronic music fan back then. But what Weidenbaum shows in some truly deft and exciting passages is that – get this – the record’s beats emerged over time. This analysis is so cool because it shows that a record’s meaning and innovations (the beats are subtle) emerge over time and that, more generally, the meaning of a work is created in time. I don’t know whether Weidenbaum was thinking about Martin Heidegger’s hermeneutics, but I certainly was. Like all good critical studies, [his book] doesn’t provide the illusion of closure; rather, it expands minds, fostering the creation of textual meaning. What drew me in particular was the album’s deep, resounding, unrepentant murkiness — which is to say, its absence of what might be considered particular. The record evades the idea of particular, except to the extent that its pronounced murkiness is particular to it. Tracks seem to bleed together, and to fall apart … … Ambient music is often packaged and promoted as being ephemeral, ethereal, but this album is more so than most; it’s tantalizingly difficult to get a grip on. One of the great benefits of a record with no words is how it doesn’t respond directly to your writing about it — it doesn’t purport to explain itself in the way that records that consist of words, such as a traditional rock and rap records, explain themselves. This is very enticing to me.